A man and his wife had been married for going on fifty years. They shared everything, but the one thing the old man’s wife asked him never to do was look in a old shoebox she kept on the top shelf of her closet. Autumn is here. The leaves on the trees in the forest around us are beginning to change color. It is hunting season in our neck of the woods. The garden is winding down for the year. Tonight’s temperature is a low of 3 Celsius. My cucumber plants are light yellow and brown. 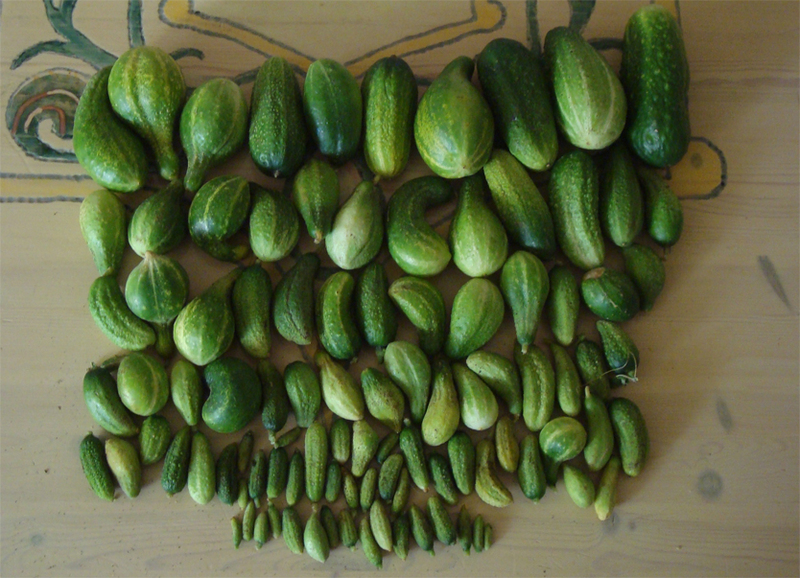 Hubby harvested these cucumbers as he pulled up the plants today. 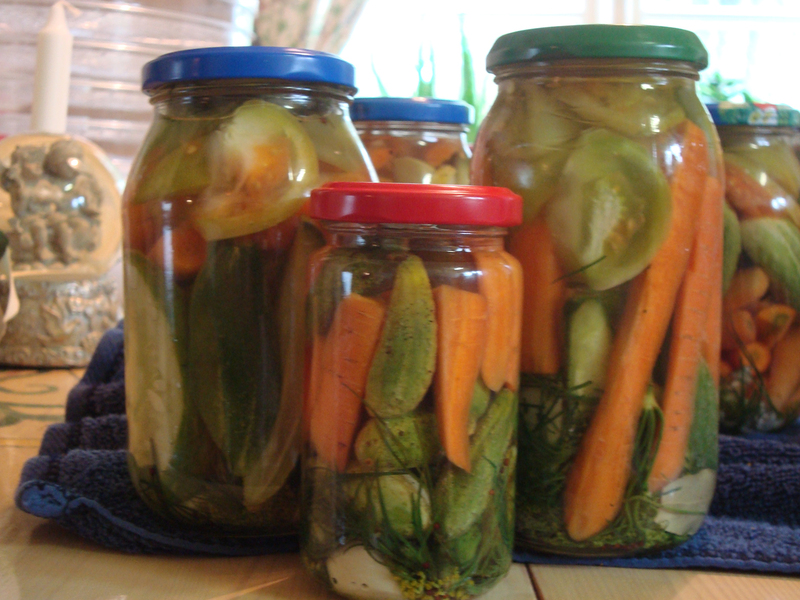 The plants are lying in the compost bin and I am going to make Salt brine pickles out of these tomorrow. Great tips to stop wasting food and money. American families spend as much as $2,275.00 every year on food that is ‘Wasted’. Food that goes into your garbage can that is perfectly good food. Start by taking a look at your current grocery shopping, meal planning, and eating habits. Save a lot of cash and eat healthier foods. First ‘Stop’ eating out or ordering in meals more than two(2) times a month. You will save a ton of money and eat healthier foods cooking and eating your homemade meals. Eating out or ordering in meals should be a special event. Not how you feed your family 7 days a week! We have been blessed with a bountiful tomato harvest this year. I wanted to try to make some sun-dried tomatoes. I found that most sun-dried tomatoes that we buy in the stores are actually dehydrated in machines not in the sun. We rarely find true sun-dried tomatoes in shops today. I went on-line and read how to make them. The finished product is our first batch that is in the glass bowl. I have already started the second batch as you can see in the picture. 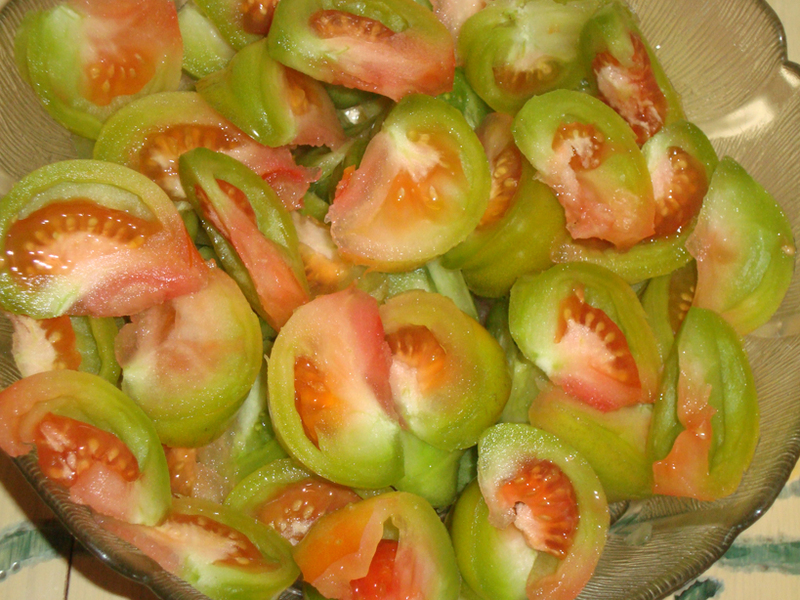 I cut the blemishes off the tomatoes, after I washed them in vinegar and water bath 3 times. I sliced the tomatoes about 1/4 inch thick. I seasoned them lightly with salt, garlic powder, ground oregano and ground basil. It took a little more than 24 hours for these to dry. The instructions I read said 6-12 hours. They were using plum or cherry tomatoes. I am using beef tomatoes thus the longer drying time. 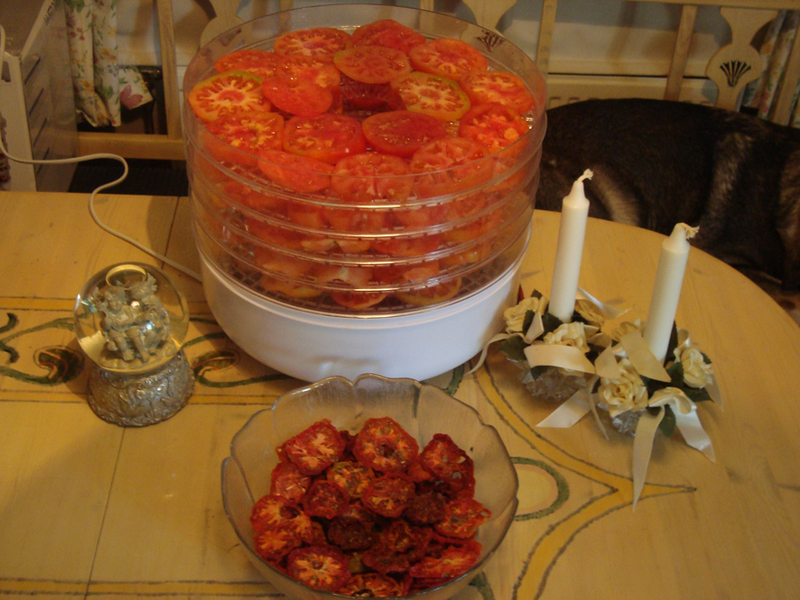 * Air dry the tomatoes for two days after you remove them from the dehydrator. I placed a cloth draped over the bowl while they air-dried. You can place them in a jar with a lid. Place them jar in a dry cool dark cabinett. * Another page I read said after two days of air drying put them in a ziplock bag in the freezer until I want to use them. *You can re-hydrate them in water and pat dry the water off them. 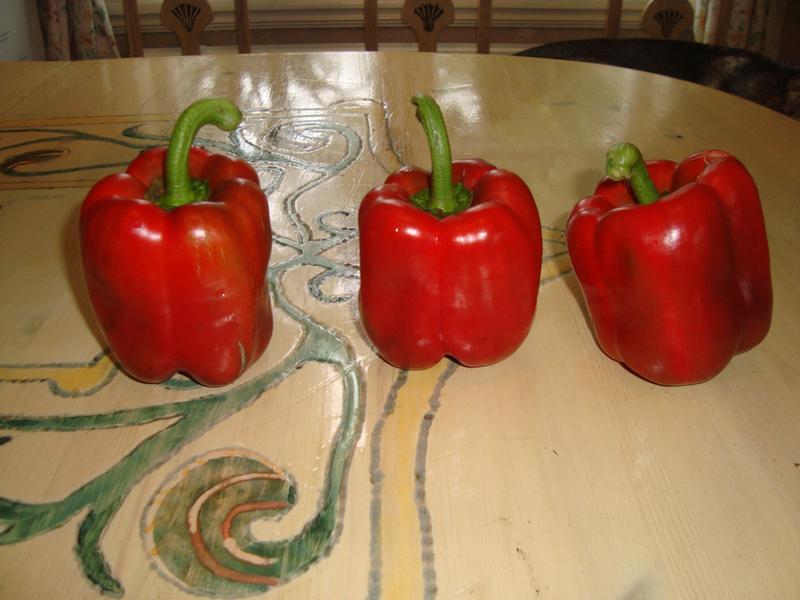 You then could put them in a food processor which makes tomato paste. You might need to add a little water to them. * You can re-hydrate the tomatoes and dry the water off and place them in virgin olive oil in a glass jar with a lid. Then place them in the refrigerator until you are ready to use them. One page I read said that if you don’t have an electric dehydrater or a solar one , that you could put the tomatoes on a deep cookie sheet and place them on your dashboard of your car. You might need to place a container under one end to make it level. How many times have you said in the summer time that your car is as hot as an oven. If you didn’t want it to smell like spaghetti or pizza just omit the oregano and basil. You would want to place your car in the sun all day. You would have to bring them in during the night and place them back out on the dashboard for a second day to completely dry them. 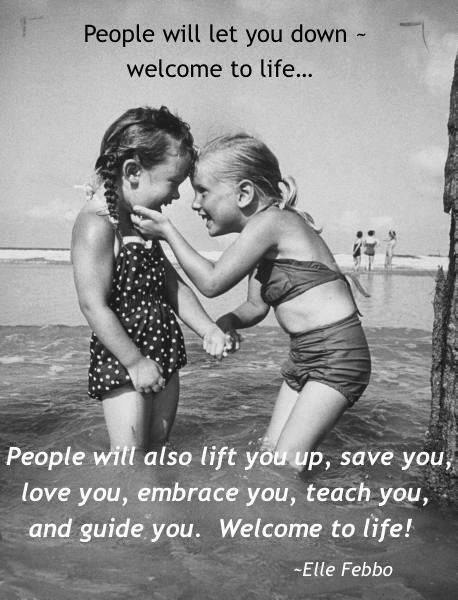 This is one of lifes truths, hard lessons to learn and greatest joy. Our best tomato harvest ever!! Look what I have harvested out of the mini-greenhouse and the Poly-tunnel today!! I am making our 3rd batch of tomato sauce and 2 batches of sun-dried tomatoes with these today. Hubby has been busy in the vegetable garden today. He has weeded it and getting ready to put compost dirt, ash and bone meal on it. We are going to transfer the strawberries to the larger bed beside it. Later we will plant garlic for next year. 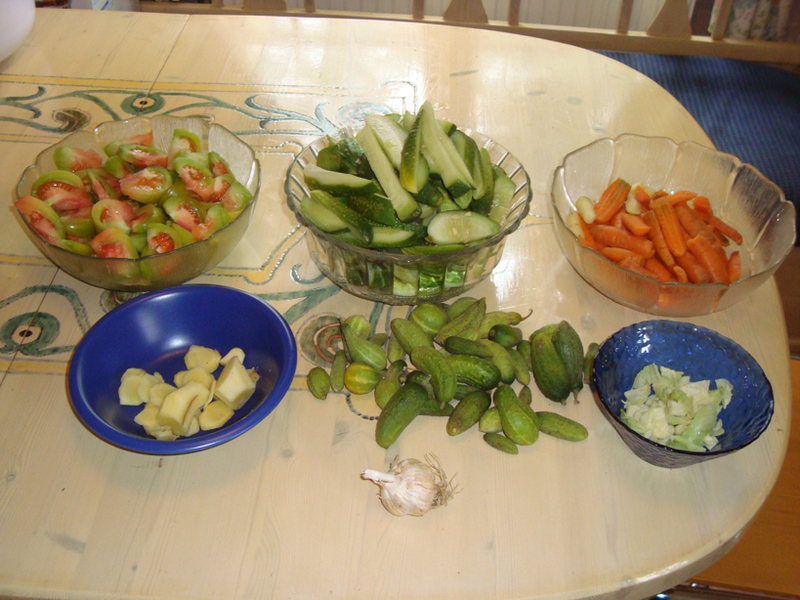 I have the last of the cucumbers to pickle with green tomatoes and carrots. Then he will pull up the cucumber plants for the year. I read on Mother Earth News today that we should not have pulled up our Celery roots and thrown them in the compost heap. We should have cut the celery and left the heart of it attached with roots and left them in our mini green house for next year. They would have survived the winter and produced again next year. I was sick when I read that. Oh well, we live and learn something new everyday. We will be doing that next year with our Celery and see how many survive the winter. This link below gives advice on storing your harvest. Over 2000 views, 200 post and 74 followers!!! Sliceofheaveninsweden has passed a mile stone 2142 views, 200 post and 74 followers. 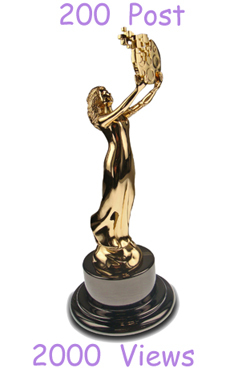 I wanted to Thank everyone who has checked out my blog and those of you who have chosen to follow it as well. I have enjoyed learning how to put up a Blog and meeting people from all over the world who share similar interest. I have learned so much from all of you just to name a few things like nutrition, environment, cooking and best of all gardening. It has been a great 8 months for me and I hope for all of you as well. I even was nominated for the Dragons Loyalty Award. I was flattered and shocked. This picture was taken in our food cellar. 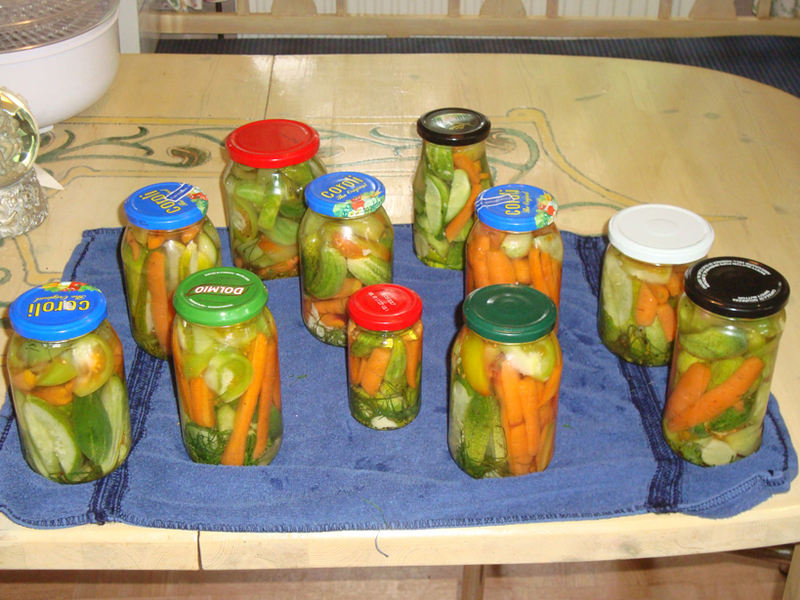 These are the pickles that We have made thus far from this years harvest. I still have 6 more jars to take down and start filling a new shelf. I am pleased. We just froze today 6 liters of tomato sauce from the poly tunnel. We are still have some jars that left over from last year as well. 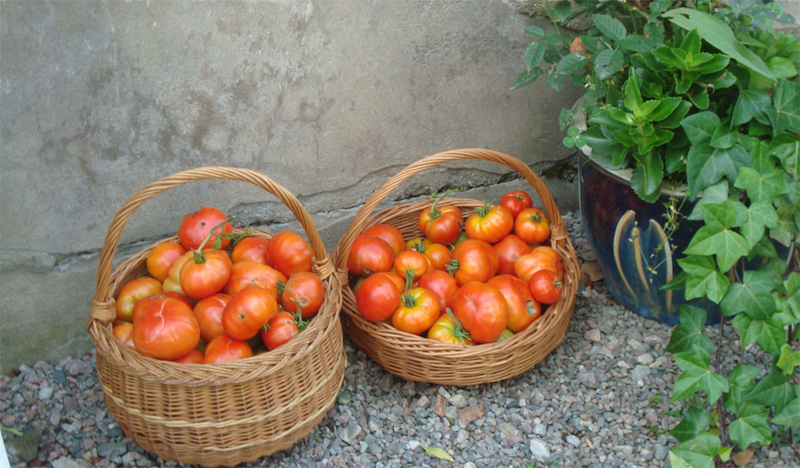 It is such a satisfying feeling knowing all the food we have stored is from our garden. Hubby was at the grocery store yesterday and saw that one orange cost a $1.15=8kr a piece. He stopped and took a double take to make sure he read it correctly. Hubby came back and said I guess we should start picking apple, pears and plums on the farm.